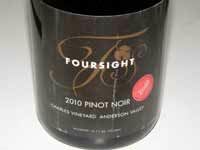 Foursight Wines is a family owned boutique producer of estate-grown Pinot Noir, Sauvignon Blanc and Semillon in the Anderson Valley launched in 2006 by longtime winegrowers Bill and Nancy Charles and daughter Kristy Charles and her winemaker spouse, Joseph Webb. The Charles clan arrived in the Anderson Valley in 1943 to join the regional lumber boom. In 1950, they bought land just east of Highway 128 in Boonville, built a sawmill, and started the Charles Lumber Company. In 2001, Bill and Nancy planted the Charles Vineyard consisting of 15 acres of Pinot Noir, Sauvignon Blanc and Semillon. The grapes from Charles Vineyard were initially sold to Navarro Vineyards, Handley Cellars, Papapietro Perry and Schramsberg. After college, Kristy moved back to the Anderson Valley with Joseph who became the winemaker for Foursight Wines. Joseph has a degree in wine business from Sonoma State University and apprenticed in winemaking at Sebastiani, Landmark Vineyards and Joseph Swan Vineyards. Kristy has been active in the Anderson Valley Winegrowers Association and the Anderson Valley Pinot Noir Festival. The winery’s tasting room, which opened on Highway 128 near Boonville, was designed and built by Bill Charles from lumber grown, harvested and milled on the Charles family ranch. The tasting room is open Thursday through Sunday from 10:00 to 4:30 except for June 20-24 and January 1-24. Private tasting appointments with winemaker Joseph Webb can be arranged in the Foursight cellar (Thursday through Monday: contact Kristy Charles at 707-895-2889). The Pinot Noirs have been consistently impressive and 2010 is no exception. They are sold through a Wine Club and the winery’s website online store at www.foursightwines.com. 14.1% alc., pH 3.57, TA 0.62, 168 cases, $38. Released May 2013. Aged in 2-year-old and older barrels so the emphasis is on the Pinot Noir fruit. Sourced from Charles Vineyard. Clones 777, 115, 114 and Pommard 05. Fermented with 30% whole clusters, 100% wild yeast, and wild MLF cultures. Punchdowns are done by hand, the wines are pressed in a traditional, wooden basket press, and aged in French oak barrels until bottling with no racking. · Medium reddish-purple color in the glass. No new oak, but still has a subtle oak note in the aromas and flavors. The nose offers scents of dark berries and grape jelly. Plenty of black grape, black cherry and raspberry flavor with a striking persistence on the huge, very long finish. Balanced and silky on the palate, this is a satisfying wine. Very good. 14.1% alc., pH 3.59, TA 0.62, 170 cases, $46. Released May 2013. Crafted from all four clones grown in the estate vineyard: 777, 114, 115 and Pommard 05. 30% whole clusters, native yeast fermentation and native MLF. Aged in 40% new French oak barrels. · Moderately light reddish-purple color in the glass. Aromas of cherries, forest floor and the slightest oak. Lighter than the 2009 version of this wine and very similar in flavor but with a redder fruit profile. Red cherries are most evident with a bright backbone of citrusy acidity and a juicy finish. Very approachable and easy to drink. Maybe comfortable is the best word. A righteous food wine. Very good. 14.3% alc., pH 3.71, TA 0.58, 125 cases, $49. Released May 2013. Produced every year since 2007. 30% whole cluster, fermented with wild yeast and wild MLF. Aged in 50% new French oak barrels. Unfined and unfiltered. · Light garnet color in the glass. The wine is quite light in weight, with aromas and flavors of red cherries and raspberries. Oak plays a significant role with aromas of oak spice and espresso. Very elegant with gossamer tannins and bright acidity. More intensely flavorful than one would expect from the light color. Good. Artisan Winery Weekend, June 29 & 30, 2013. Visit Foursight and other family owned wineries along Highway 128 with open houses, food, special releases and one time only deals. Foursight is teaming up with Aquarelle Restaurant for a series of “Wine Bar Nights” at the Foursight tasting room. Small bites paired with Foursight wines. Fridays, May 31, July 19 and August 2.